It's been six years since the events of Digimon Adventure, and the Chosen Children are beginning to drift apart. The gate to the Digital World has been closed for three years, and the four newest Digidestined have been missing for months, no doubt off on some adventure that the old gang are too busy for. For most of the kids, growing up has been exciting, and they barely think of their days fighting evil Digimon anymore. But things are a little more complicated for Taichi (Tai). He basically never sees Jou (Joe) or Mimi anymore, Sora and Yamato (Matt) have started dating more seriously, Takeru (T.K.) and Hikari (Kari) are moving through the grades beneath him effortlessly, and Koushiro (Izzy) is already finding success as a brilliant young entrepreneur. (I mean, have you seen his apartment?) None of them can even find time to come to his soccer games anymore. Growing up is hard to do. So when Agumon suddenly appears to protect Taichi from a rampaging Kuwagamon downtown, he's nothing but relieved at first. The gang's finally coming back together for another world-saving adventure! Unfortunately, Taichi never considered the possibility that he might have changed even more than they have over the years, and the battle he faces from within may be more intimidating than any Mega-level monster. Ever since Digimon Adventure tri was announced almost a full year ago, fans have been filled with trepidation over the unexpected anniversary project. The heavily anticipated Sailor Moon Crystal and its mixed reception were still fresh on everyone's minds, and there just wasn't much (if any) precedent for a children's anime getting an older-audience targeted sequel over a decade after the fact. Would this be a pure nostalgia vehicle for post-pubescent Digimon lovers, or would it be a more middle-ground attempt to draw new kids into the aging toy franchise with a cool high school cast? Now that the first taste of the ongoing revival has finally been released, there can be no mistake: this show is a love letter to prior fans and prior fans only. 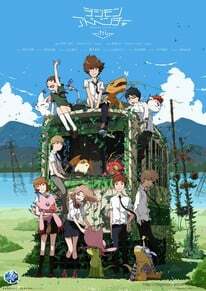 It doesn't just assume intimate familiarity with the original series, it's also built from start to finish on the wistful emotions of grown Digimon lovers and an almost melancholy ache for innocent days gone by. It's probably not what you were expecting from the frequently gaudy and goofy Digimon franchise, and whether that's a good or bad thing largely depends on what you're looking to get out of this return to childhood. This first release also works better as one movie (interrupted by OP and ED themes) than the four TV episode-format delivered to Crunchyroll for streaming. There's little to no attempt at splitting the overall story into four distinct chunks, with episodes ending abruptly and picking back up in weird places, after those poignant updated versions of the classic theme songs play once again. (This gentler version of "Butter-Fly" is especially powerful considering Koji Wada's recent battle against throat cancer.) The awkward splitting of these sections into episodes is all the more glaring when Digimon Adventure tri turns out to be glacially paced all the way through, taking on an atmosphere of the very mellowest high school slice-of-life, with the notable exceptions of Digivolution sequences and a couple explosive battles. Still, very little happens in this first film of a promised six. The Chosen Children reunite, they learn about a new threat from a secret government organization researching the existence of Digital Monsters, and they argue about whether they should fight it or not, leaving the group still uncertain by the final credits. It's an odd beginning that runs the gamut of "big ideas" from heavy romantic subtext between characters to an explosive appearance by Omegamon, but the story still isn't headed in any clear direction by the time the dust settles. Honestly, that doesn't matter as much as it probably should, because the time in between ill-defined plot points is packed with heart-melting fanservice for Digimon fanatics. (There's also just plain old regular fanservice from Sora and Mimi, which might be either cute or deeply upsetting depending on the viewer.) No callback falls out of place and no romantic pairing is left unteased as the gang interacts with each other and their Digimon partners in ways more appropriate to their new ages. When Koushiro (Izzy) starts rattling off potentially vital exposition about the new enemy in way too much detail, while Taichi (Tai) and Yamato (Matt) ignore him and shout at each other over something that should never have become a full-blown fight, it couldn't feel more like coming home again. (When the altercation ends with Joe remarking that he never has time to see his girlfriend, it becomes more clear that some things really have changed. To be fair, the other Digidestined seem just as shocked by this as the audience.) The story may not deliver on the high-stakes excitement fans have been waiting for, but the emotional payoff is pitch-perfect. Well, almost pitch-perfect. While the cast's chemistry is wonderful and their Digimon partners retain their adorable senses of humor (breathing some much-needed energy into the otherwise pastoral proceedings), some changes to Taichi's character are a little head-scratching. Tri has decided to follow the original gogglehead's convictions from the first series to their furthest possible conclusion, leaving him more meditative and hesitant even than Matt in the original Adventure. After seeing Kuwagamon cause untold amounts of property damage, Taichi realizes that he sees this kind of danger very differently from when he was a child. Every building destroyed makes him think of the people who could have been inside. A crushed pink cell phone in the rubble makes him think of his sister, and what would happen if it was hers. It makes him not want to fight. The show does its best to convey the gravity of his concerns, and it's mostly successful, but this new characterization is so far away from even the more responsible Taichi we remember (especially because no one has gotten hurt or even been endangered by the battles yet) that's it's pretty hard to swallow. It seems like an iffy contrivance meant to get Taichi and Yamato at each other's throats once again, forming the weakest distraction in what is otherwise a tame-but-rewarding start that captures the spirit of Digimon Adventure in a small-but-moving way. Outside of a couple other Digimon movies, this is by far the nicest production work the series has ever had. By late-night TV anime standards, it may be middling, but by Digimon standards, Tri looks like a million bucks. Concerns over "sameface" from the early production materials are all but forgotten, as all the characters are easy to distinguish from one another in motion, and they even have distinct tics and manners of expression in performance that the old series could never claim with its more meager animation chops. Like the other two theme songs, there's a new version of "Brave Heart" to go along with the battle scenes, which feature Tri's most impressive animation and some of the most lovingly detailed versions of the Digimon's more dangerous forms. The series doesn't spend much time with the new Digidestined girl, Meiko Mochizuki, until episode 4, but she's instantly charming as the blushing space cadet with a big heart that the team welcomes with open arms. There's more than enough detail in these first four episodes for Digimon fanatics to pick apart (like the potential retconning of minor aspects from Adventure 02), but it's probably best to just marinate in the experience for its simpler joys. The original Digimon story is back, and it's clearly being written and illustrated by people who love and understand the original material, even if they aren't doing anything daring with that material just yet. This might be a slow build, but even if the destination is still uncertain, the journey is already rife with the rosy smell of treasured memories. And isn't that what adventure is all about?